The Gay Gamer: What big teeth you have, Ms. Pac-Man! 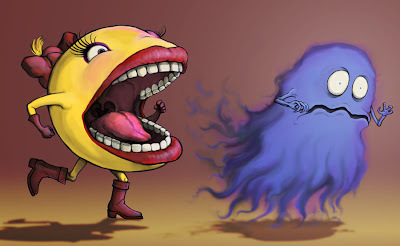 Everybody loves a good Ms. Pac-Man-inspired painting, right? Well, then everybody should love the following, which was produced by Madison, Wisconsin-based artist Ryan Grant Long. Long's currently dating a friend of mine in Madison (my home town), by the way. What do you think are the chances I can get that friend to twist Long's arm and convince him to create something similarly fabulous for me (or, better yet, for this blog)? To see more of Long's work, check out his blog or his deviantart gallery. That would be the most amazing twist EVER. I'd love to see what you'd commission.